Many notable advocates for people impacted by wind turbines contributed their observations in June 2015 to the Australian Senate hearings. Among them, Lilli-Ann Green of Wellfleet submitted this set of slides about her interviews around the world. She met people living near wind turbines and gathered information from scientists. The transcript of her testimony is posted on National Wind Watch and the Australian Parliament website. 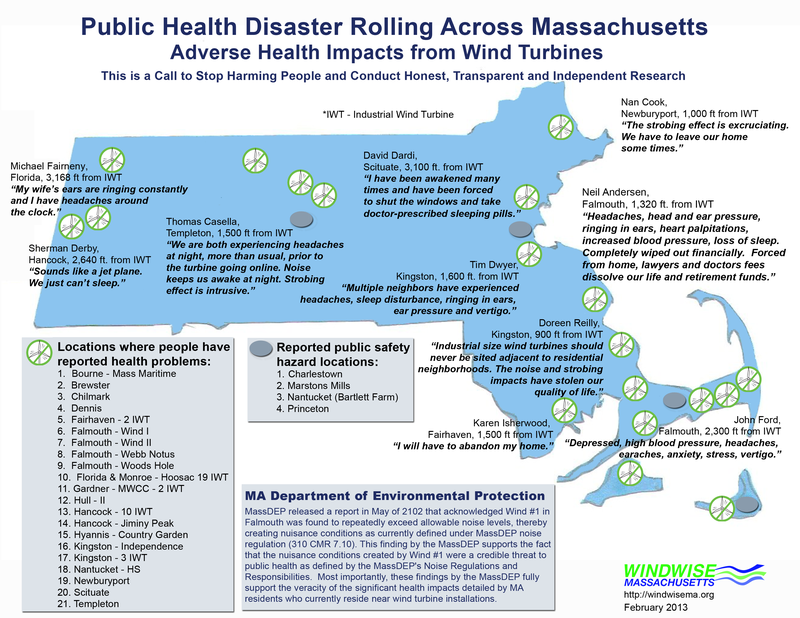 “Wind turbines can harm humans” is the title of a 2012 Carmen Krogh white paper. This four-page hand-out contains 54 references supporting statements that wind turbines impact human health. rights of every human being without distinction of race, religion, political belief, economic or social condition.